In today’s digital world, videoconferencing can be a valuable addition to your firm’s service model. It can help meet the needs of tech-savvy next-gen clients and manage your intense schedule of client-facing activities. Plus, you can connect directly with your clients when either of you is on the road. The question is, "Should you videoconference with your clients?" To help you determine if videoconferencing is right for you and your clients, there are a few questions you should ask, including whether your clients would be interested in this mode of communication, as well as some best practices to keep in mind. First, do you know if your clients are open to meeting over video? Are they comfortable with technology? What videoconferencing applications do they have access to? Be sure to do your due diligence to ensure that holding meetings via video is in line with the wants and needs of your clients. Once you’ve assessed your clients’ level of interest, consider which topics would be appropriate to discuss over video, as some issues are best delivered face-to-face. Routine financial reviews, especially if the clients’ financial plan has minimal changes, would be ideal to conduct via videoconference. A new client acquisition meeting? Not so much. The size and scope of the meeting can help you determine the best method of communication. If you are having an estate planning meeting with a client where an attorney or CPA might be present, the face-to-face meeting still prevails. Which Clients Should You Start With? You might want to have a trial run with lower-tiered clients, as B and C clients are not as financially productive for your business as your A clients. Here, keep in mind that there will always be clients who can benefit from your firm's service and culture, which are often cultivated through in-person interactions. As with anything new, it’s best to look before your leap. Here are some videoconference best practices to keep in mind if you decide this service could work for your practice. Test the technology ahead of time. Whatever software you choose, test it out with another colleague. Gather feedback at the end of these practice calls, keeping track of any issues you encounter along the way. Your staff should get comfortable with using the software as well, as they too may be running meetings over video. Choose a quiet space. Noises over videoconference are often amplified, so close the door to your office and turn off your cell phone, TV, and radio. Also, set all incoming calls to go directly to voice mail, so you’re not interrupted with an untimely phone call during your meeting. Finally, if you’re videoconferencing from your home office, ensure that your house is quiet at the time of your calls. Let staff and colleagues know you are unavailable. Even if your staff does not see clients walk through the door, they should know you are not available. Let them know you are videoconferencing ahead of time so that they don’t walk in unannounced. Check your surroundings. Scan the room and be sure to remove any clutter. You’ll also want to work out exactly where the camera should be and consider securing your device in a stand. After all, jerky camera movements can have dizzying effects if they’re seen live! Establish the rules ahead of time. It’s best for you to initiate the videoconference and to let clients know exactly when to expect your call. If the technology fails, have a backup plan in place (e.g., suggest you will call them back immediately on the phone). 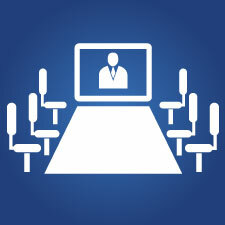 Treat a videoconference as though it’s an in-person meeting. As with any face-to-face meeting, schedule it and be prepared. This includes dressing appropriately according to your office culture. Ask your clients to prepare ahead of time. Send a premeeting e-mail to let clients know they should take the video call in a private setting with minimal noise and distractions. Also, give them guidance on how to adjust their volume or screen resolution. You might also consider sending ahead any documents you will share during the meeting, just in case there are technological hiccups during your call. Check in with clients during the call. Periodically check in with clients to ensure that they can hear you or, if you are sharing a document, can view the document. If you are sharing a document, be prepared to ask them to turn to a certain page or give directions on where you want them to review. Go slowly and ask a lot of questions to make sure you are communicating clearly. Develop procedures. Once you have a few calls under your belt, create a repeatable process to add to your procedures manual, and educate your staff on how you prefer a videoconference to run. You should also create a client-facing document instructing clients on how to set up their system and what your expectations are for the meeting. Of course, walking through your office doors allows clients to experience your culture and personal service, so be sure to communicate with clients that daily service needs can always be met by calling or e-mailing you and your staff. But if done correctly, videoconferencing can enhance your service model, and I think you will find that many clients will appreciate the convenience and flexibility. Are your millennial clients interested in videoconferencing? Which software do you prefer? Please share your thoughts with us below.